Susan Nash and Family Killed in Las Vegas Parking Lot Shooting; Was This Tragedy Preventable? Did a security lapse contribute to this tragedy and are justice and compensation available to the Nash family? A family is seeking answers and justice after an unconscionable shooting claimed the lives of Las Vegas special education teacher, Susan Nash, and her two adult children, De’jonae and Deonte Nash, Sunday night, October 14, 2018. According to The Las Vegas Review-Journal, gunfire erupted “in a parking lot at West Lake Mead Boulevard and Simmons Street,” striking four people. Tragically, Ms. Nash and her two children succumbed to fatal injuries. The identity and condition of the fourth victim has not been released. “The family has created a GoFundMe account to assist with expenses after this stunning loss,” per KTNV reports. Did negligent security contribute to this senseless Las Vegas parking lot shooting? We represent individuals and families who have suffered a tragic loss or injury as a consequence of negligent property security. Read Our Legal Take below to find out if the Nash family may have a legal avenue for justice and claims for substantial compensation in Nevada, or call now for a free consultation with our legal team: 888.842.1616. Shopping center parking lot patrons have a right to feel safe and secure while on the premises. The Murray Law Firm questions the level of security provided on the property and whether this tragedy may have been prevented. 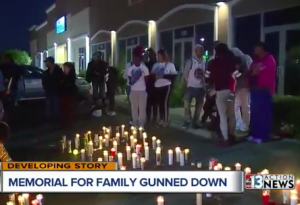 What security measures, such as bright lighting, surveillance cameras, off-duty police, and security personnel, were in place to deter crime and protect the Nash family at the time of the shooting? Generally, property owners are required to protect all those legally on the premises from any foreseeable harm. Should the facts of this matter reveal that the parking lot owner failed to provide adequate security to protect those on its premises, the families of Susan Nash and her two children may seek justice and elect to pursue legal claims for their loss. Additionally, the surviving victim of this tragic shooting may pursue legal claims for his injuries.